We started the stars hive just beside the sky hive. We left a container of crystalized crushed comb mixed with water in an open feed container. It had rained recently so we couldn't determine if they had taken any of the honey feed as the container still contained water. The lids on both the sky and the stars hive already had noticebly more propolis going on then the other hives we started this year. They also did some serious work on the warré seed frame that we left in the nuc box. Contained nectar, some pollen and a few eggs. 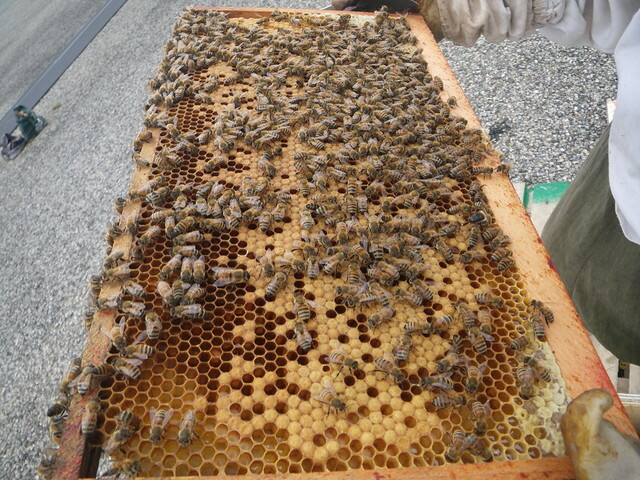 It's interesting to see that the colour of their comb was a bright white, whereas the new comb in the sky hive had more of a yellow shade. Evidence each hive has focused on different nectar sources? Quite a bit of comb had to be trimmed off the sides. We flipped the bottom board to the wider setting and left the comb there. Spotted our marked queen on the feed frame. 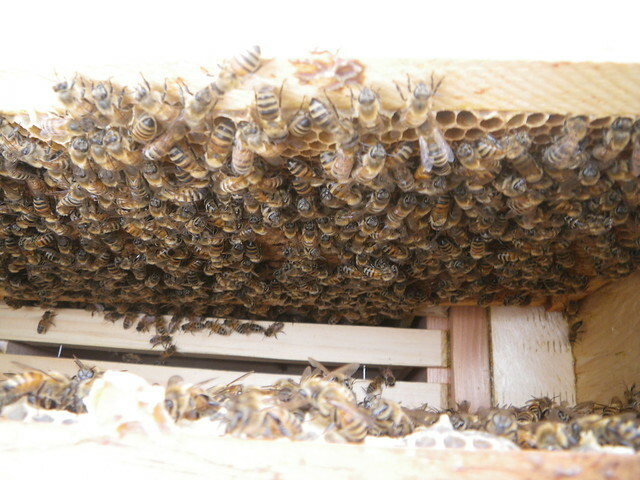 Their population looks set to take off significantly in the coming weeks, and it looks like there is good flow for comb building at the moment. We had ordered package bees back in January, but we had trouble getting the breeder to give us the bees. As it was starting to get late in the season, I whipped together two more nuc to warré adapters and we bought nuc's from a different breeder instead. 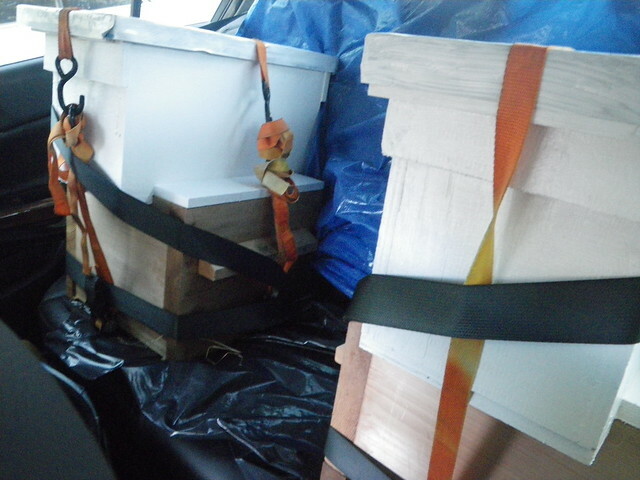 Here they are buckled in on the back seat of my parents car. 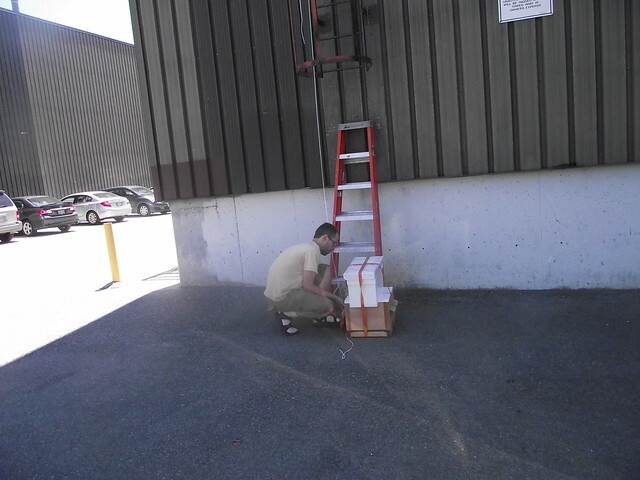 Using nucs meant we had a little more weight to haul up to the roof. We just used a rope, tried to set the angles to our advantage and pulled. It worked, but as we anticipate heavy honey boxes needing to descend from the roof in the future, we are going to try and source a hoist with brakes. We named this colony Sky. Things were relatively quiet around the entrance but it was a cloudy day. 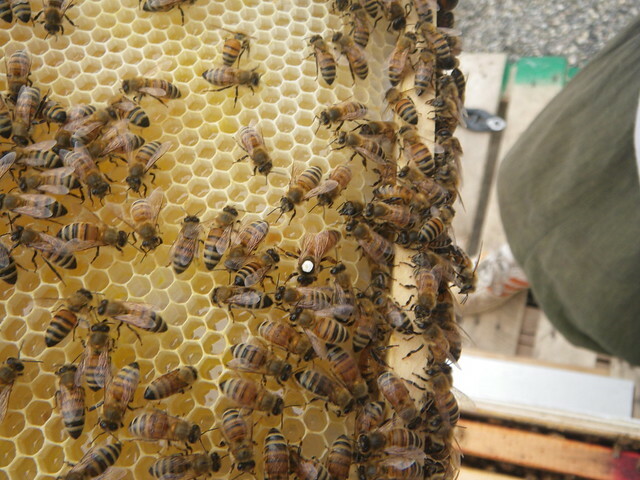 The breeder gave us frames from different colonies so the queen had been placed in a cage. 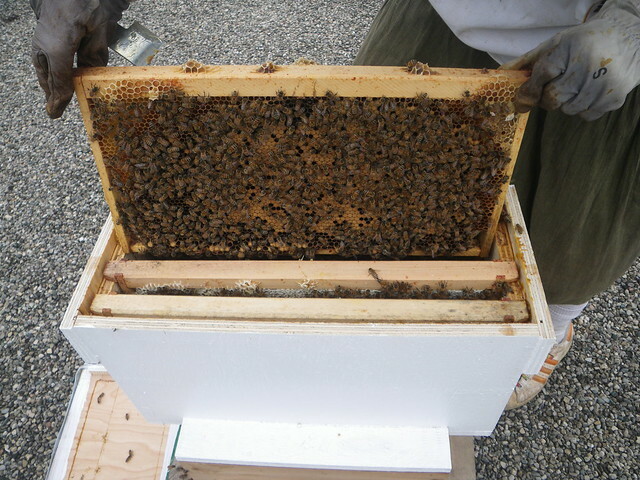 They built a whole lot of comb on the empty frame we placed in the nuc to seed the warré shaped box below. The comb mostly contained nectar, but there were a few eggs present. We moved the warré seed frame down. 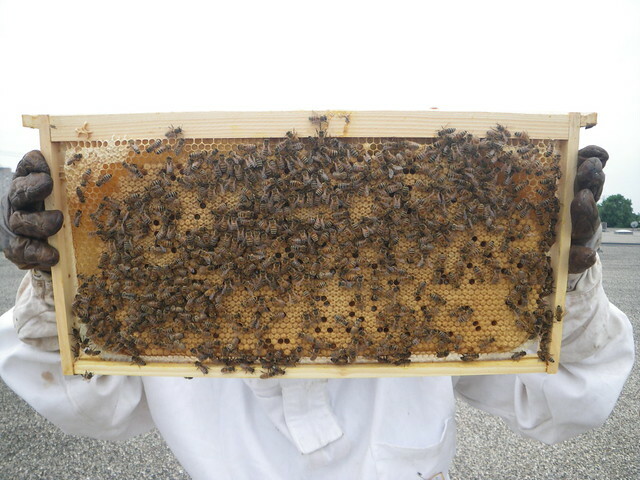 The comb built on the side of the frame was trimmed off and squished in around the top bars of the nuc. 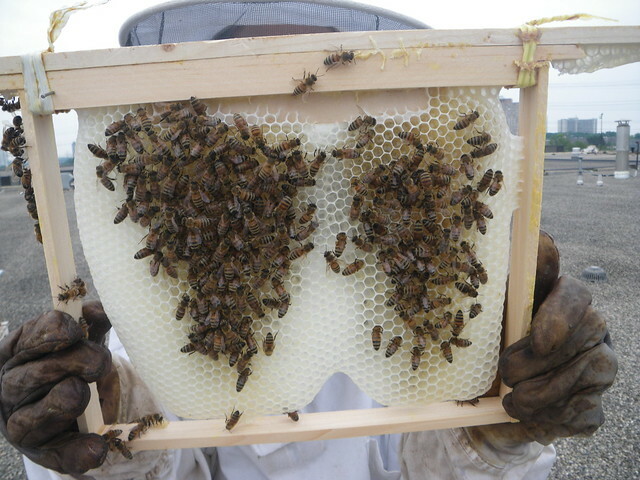 The waste of comb is extremely disappointing and has proven to be largest drawback to this method of encouraging the bees to move down into the warré box. 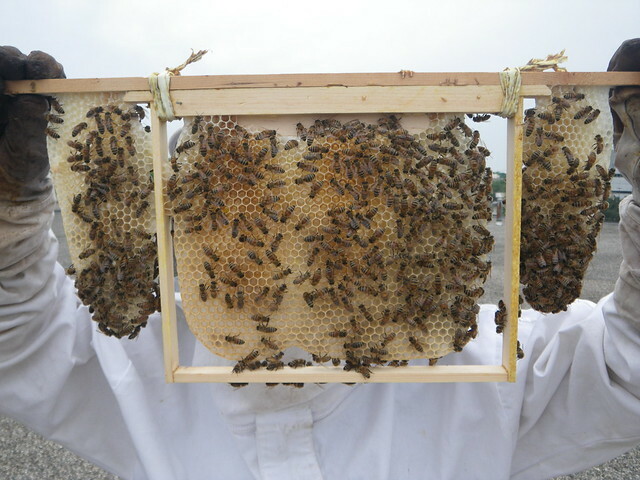 It caught me by surprise as I had started comb for a top bar hive in a similar way last year and expected the sides to be the last place they would build comb. In the future I will have to consider blocking off the side gaps around the frame so this doesn't happen. 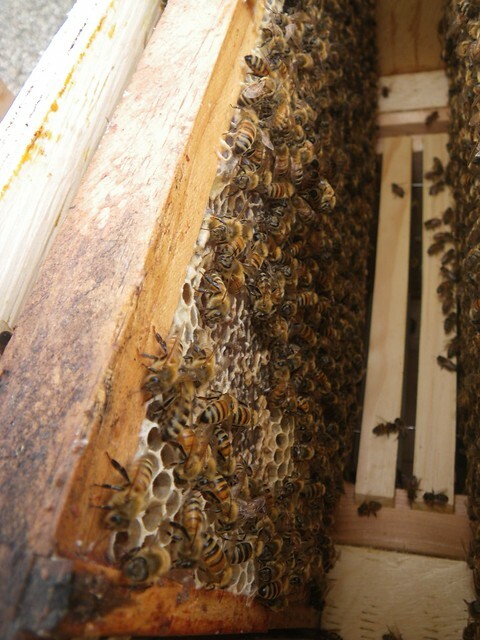 You will also see this behaviour in hives that are already established at a location as younger bees develop into foragers and leave the hive for the first time, typically, this behaviour will not be as pronounced as when moving a hive. It is possible to confuse robbing with orientation flights. If the bees are young and fuzzy and they are peacefully entering and exiting the hive it is most likely orientation flights. I used inspiration from the colony transfer section of this page and the simple D. Coates nuc box plan as the basis for my lang to warré transitioning nuc box. I need to put this box on top of a warré box so I reduced the height of the walls a 1/2 inch to compensate for the height of the floor that I am removing from the D. Coates design. The only other modification to the base of the design was to omit an entrance in this box. Instead, the warré box will sit on a regular bottom board entrance. I did add a floor just to the section that hangs over the side of the warré in the back and front. 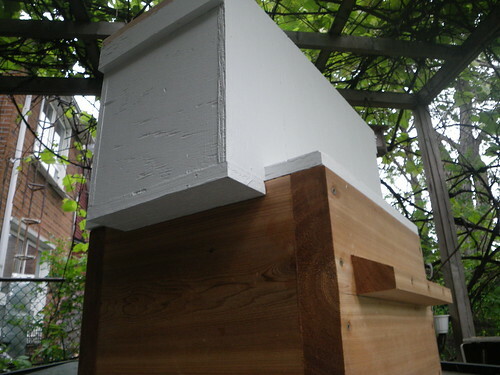 I also glued and nailed 'wings' to the side of the nuc which extend to the edge of the warré box. The wings serve as a roof for the section of the warré the nuc does not cover. 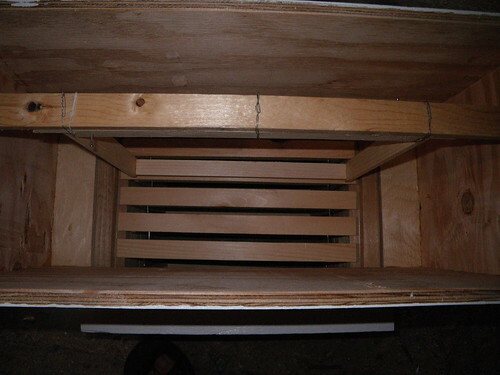 The wings are slightly asymmetrical, this was done in order to position the nuc box on top of the warré such that the gaps between the langstroth frames will line up with gaps of the warré frames. The hope is that this will make it easier for the bees to move between the two boxes. I made a five frame nuc box, but around my area they typically sell four frame nucs. 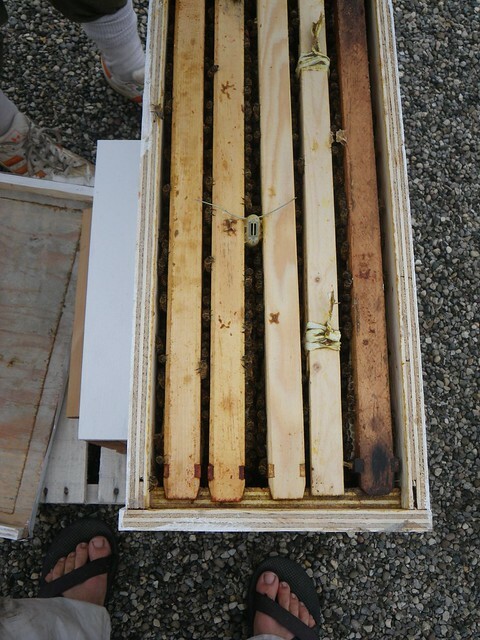 So, in addition to the frames I receive from the bee breeder, I will place one of my smaller warré frames in the nuc box. 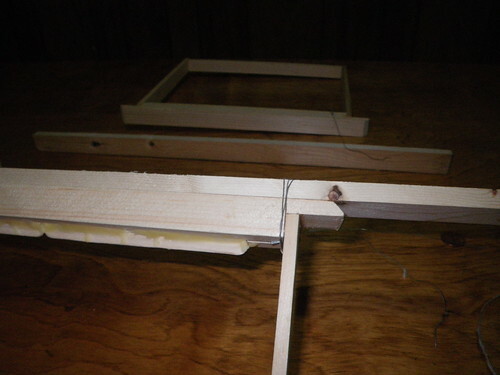 To do this I simply used wire from twist ties to strap a frame to a wooden slat that fits the length of the langstroth. 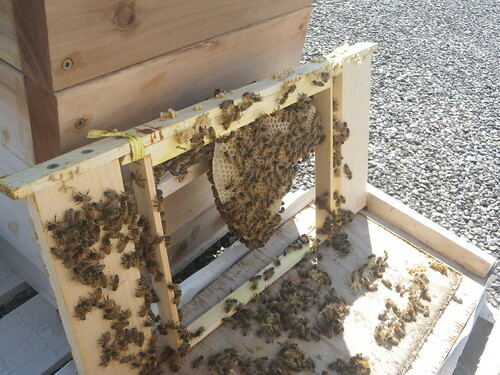 Once the bees start drawing out this frame I will be able to remove the wooden slat and place the frame in the box below to encourage them to move down. On top of the plywood roof I added an old printing press plate that I sourced from a local publisher and a discarded plastic corflute sign board (similar to that used for election signs). The sign board has air pockets and will hopefully slow the heat from the sun on the metal from conducting through the roof. The printing press plates are simple to work with. I cut it to size with regular scissors and staple it in place with an ordinary staple gun. 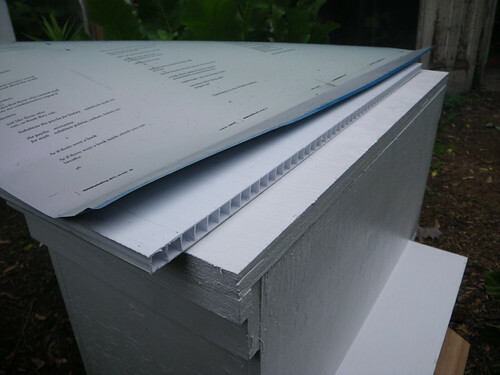 The plywood was scrap from neighbourhood carpenters, and the paint came from the municipal household hazardous waste dump, thus the cost of making this box was virtually nothing. 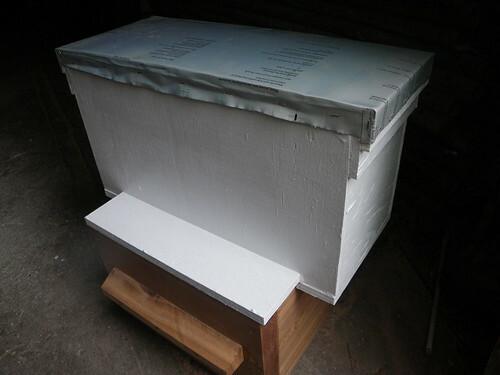 I'll be eager to get the nuc off the hive and give them a proper roof, but am confident this box should make for a smooth and simple transition between the different shaped hives. Update: I've now successfully encouraged bees to move down with this method. You can see the nuc transition box in practice here. The main issue I had was that they built comb on the side of my frames that would need to be broken off. In subsequent attempts I used a wooden block to prevent this. Each wooden block is attached using a single screw, allowing the block to turn and making it relatively easy to remove the propolized frame. 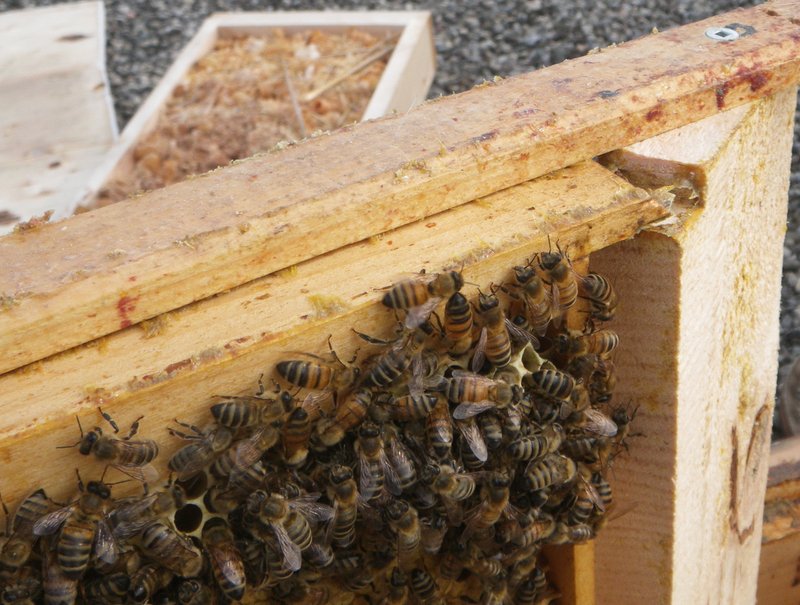 My current approach is to try to move frames down, and place new frames back in the nuc as long as they are raising brood in the nuc. As comb building is prioritized at the top of the hive, and I already have drawn combs up here, I found it to be a good way to keep getting straight combs. 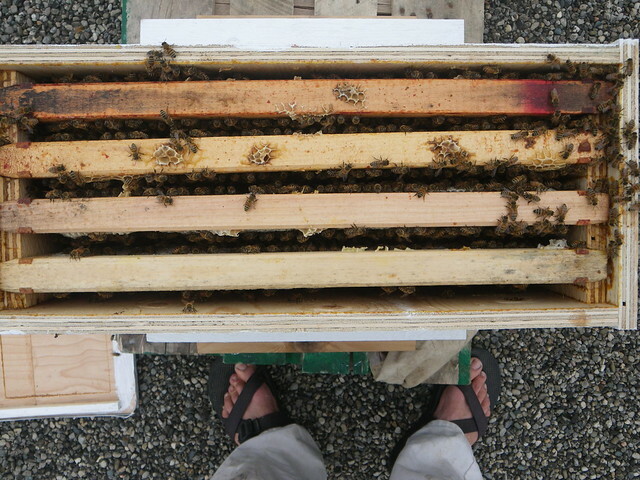 I stop adding new combs once I no longer have a brood frames in the nuc box as they bees like to make honey combs bulge out into any available open space.